The weather has been rather lovely and it’s definitely time for some lighter, brighter fare. The summer before I finished school I went to Greece with friends to Horefto – a beautiful sleepy seaside village flanked by lush green vegetation on one side and white sand that slips into the Aegean sea to the other. It was a magical holiday and the food has been imprinted on my memory ever since. One of the dishes prepared for us at home – stuffed peppers baked in the oven – oozed sunshine and goodness. I haven’t been back to Greece since but that dish takes me straight back to lazy summers and siestas. These succulent peppers are a vegetarian version, jam-packed full of ingredients that scream sunshine: mint and sweet tomatoes, oozy feta and pine nuts. Simple to make and a great way of using up leftover rice, this healthy dish works as a side dish or a light main. Serves 2 as a main, 4 as a side dish. Cut the peppers in half lengthways and scoop out the seeds with a spoon (or your fingers…). Place on a baking tray face down and bake for 20 minutes to soften. If using uncooked rice, cook in a saucepan of boiling water according to its instructions. In a frying pan on a medium heat, sweat the spring onions in the olive oil for a few minutes (being careful not to brown them). Add the garlic and pine nuts and fry for a couple of minutes. Add the tomatoes and simmer for about 5 minutes, stirring occasionally. Take off the heat and stir in the cooked rice, feta, lemon juice, herbs and seasoning. Stuff the peppers with the mixture, pushing it down (again, with your fingers) to ensure your peppers are jam-packed. Return to the oven and bake for another 25 minutes. Serve warm. 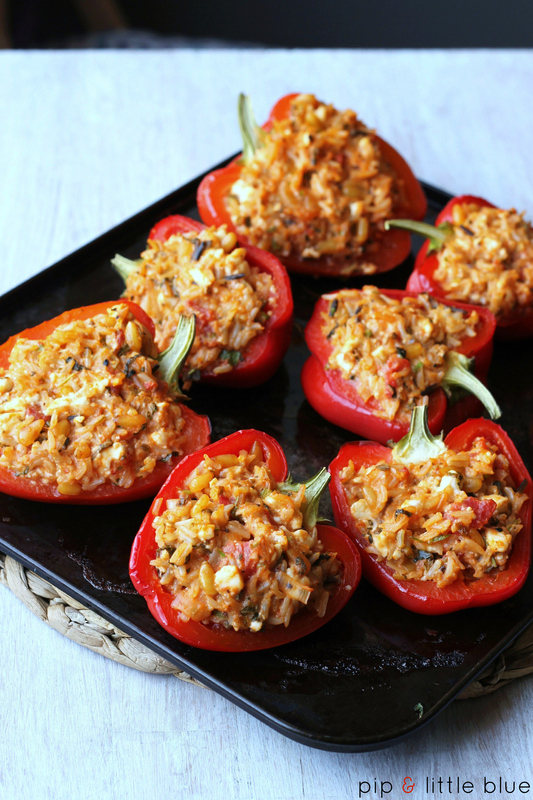 Tags: easy, feta, gluten-free, Greek, midweek, recipe, side dish, stuffed peppers, vegetarian. Bookmark the permalink.